A large historiated initial D opens Psalm 38: Dixi custodiam vias meas ut non delinq[ua]m in lingua mea (I said, "I will take heed to my ways that I not sin with my tongue"). Inspired by these words, the Bute Master depicted King David, traditionally considered the author of the psalms, pointing to his mouth. 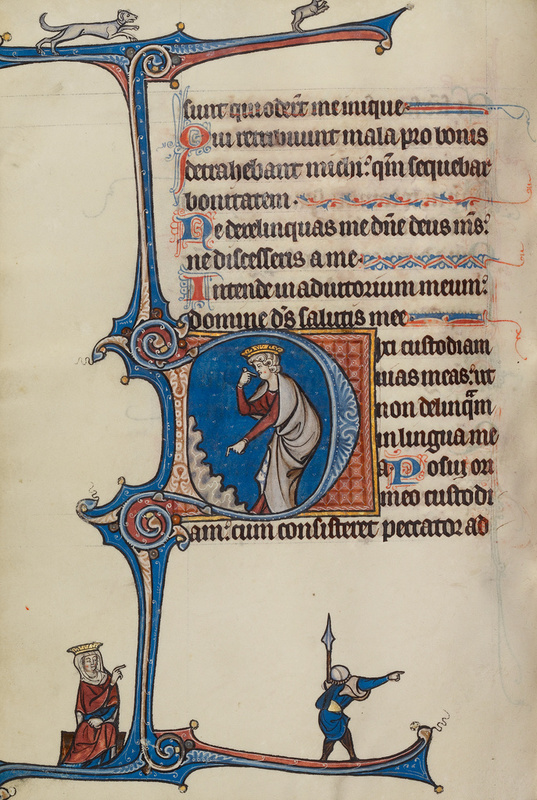 With his other hand, David gestures toward the ground and the seated woman at the bottom of the page. She in turn points toward a soldier. Presenting his back to the viewer, the soldier twists his head up and to the left while pointing his spear toward David. This series of gestures creates a visual circuit that links the figures as it guides the viewer's gaze around the page.